Videocassette: 1990, 1 commercial on 1 videocassette. The commercial was used during Nick Rahalls campaign for the 1990 U.S. congressional election in District 4 of West Virginia, Democratic Party. Papers: ca. 1977-2015, approximately 2,000 boxes. 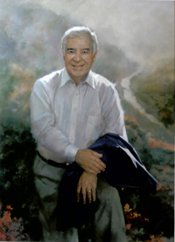 The Rahall Congressional Collection consists of testimony, speeches, news releases and other documents generated during the years Nick Rahall, a Democrat, served in Congress and showcases the impact his service has made on the nation, state and the region. The collection has not yet been processed.